Wash your hands after handling. 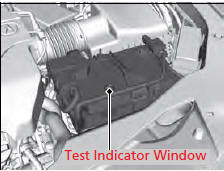 The test indicator’s color information is on the battery. Clean terminals with a damp towel. Cloth/towel dry the battery. Coat the terminals with grease to help prevent future corrosion.